Naomi, he admits, took hold of the manuscript with a marked lack of enthusiasm, but he was rewarded. The story kidnapped her and the only thing wrong with it, she told him later, was that she didn’t want it to end. King didn’t write the story for publication—he wrote it for his daughter. However, he says, “I did her the courtesy of writing Eyes of the Dragon for myself too, because if you are writing just for someone else, you always write down.” The book is dedicated to her and to Peter Straub’s son, Ben, and characters bearing their names appear in the novel. King says that, like any children’s story, it is also a story for grown-ups, like Treasure Island or The Hobbit. Adults “hear reverberations in the story that maybe the child doesn’t hear because he doesn’t have the same experience.” He calls it an adult novel masquerading as a children’s story. In the early 1980s, instead of sending out Christmas cards, King created chapbooks containing chapters of a story called The Plant. He established his own publishing company, Philtrum Press, and enlisted the help of his college friend Michael Alpert to produce these booklets. Installments of The Plant were distributed in 1982 and 1983; however, in 1984 King had something bigger in mind. He wanted Philtrum Press to produce a lavish, enormous edition of The Eyes of the Dragon. King and Alpert held discussions about the book’s design and construction. “I knew that I would not be bound by the usual constraints of commercial publishing,” Alpert wrote, “but instead I would have the kind of opportunity that book-designers can usually only dream about.” They settled on a large-format volume printed from metal type on fine acid-free paper, illustrated with black-and-white line drawings, housed in a slip-case. The paper, selected to give the impression of the napkins that are so crucial to the plot, was special ordered from France to have the correct grain properties required of a book of its size. It took Alpert a little over a year to design and produce the book. Stinehour Press of Lunenburg, Vermont printed and bound The Eyes of the Dragon—they had previously produced The Plant. Illustrations were created by Kenneth Linkhauser, an unknown Bangor artist who Alpert happened to meet at his picture-framing shop. Linkhauser, as it turned out, was planning to send one of his compositions to King in hopes of working with him. Philtrum Press produced 1250 copies. One thousand, numbered in black ink, were offered to the public at a price of $120 via ads in Fantasy and Science Fiction magazine. The remaining 250 red-numbered copies were issued to friends. The production was budgeted so that the commercial copies would cover the cost of the gift copies. Since more than 1000 orders were received, a lottery was held in early November 1984. Three years later, King agreed to allow the publication of a trade edition. Numerous changes were made to the text. Deborah Brodie, Senior Editor for Children’s Books at Viking, asked King to introduce Ben Staad earlier in the book. In the original, Peter’s closest friend since childhood doesn’t show up until nearly the midpoint, which makes his appearance something of a surprise. She said King added several new references to Ben and the scene about the three-legged sack-race that explains the genesis of their friendship. Other changes reflected the fact that the book hadn’t been previously copyedited. The genders of Frisky the dog and Peony the horse switched back and forth in the original. One change was made because of the art – Frisky was originally a white Anduan husky but that didn’t work against a snowy background, so King changed it to black-and-white at Brodie’s request. She also suggested bringing Brandon and Dennis into the story earlier and having Peter exercise during his five years in the Needle. The Viking edition, released in 1987, had a first printing 1000 times larger than that of the limited edition. Some accounts claim she read Carrie and expressed no interest in reading more of his work. “Why I Wrote The Eyes of the Dragon,” Castle Rock Newsletter, February 1987. “The Limits of Fear” by Jo Fletcher. Knave Volume Nineteen, Number Five, 1987. The “philtrum” is the vertical groove between the base of the nose and the border of the upper lip. No, I don’t know why he named it that! “Designing The Eyes of the Dragon,” Michael Alpert, Castle Rock Newsletter, August 1985. Interview with Tyson Blue, Castle Rock Newsletter, March 1987. Viking chose to create new artwork by David Palladini for their edition. This was the first of King’s trade releases to be illustrated. Every writer has a fairy tale story in them. This is a fun one. Thanks again Bev, for giving the context of this book. Oddly, this book was my first introduction to reading Stephen King – a constant reader ever since! Great essay, Bev. 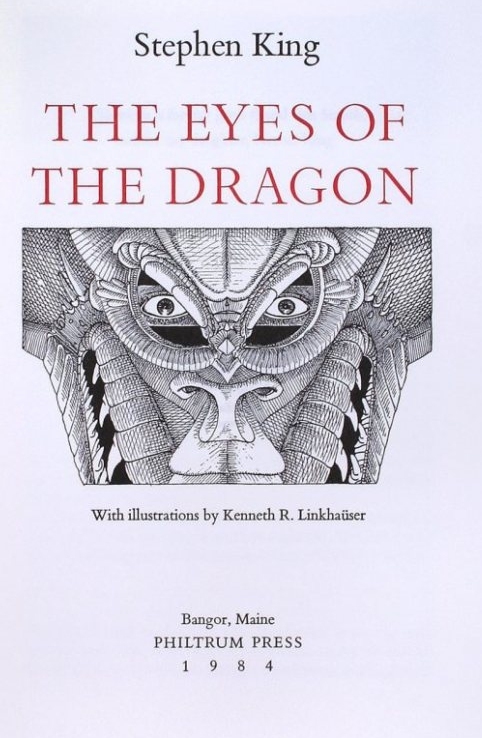 “The Eyes Of The Dragon” was a marvelous title for that book. SK knows how to please his readers. Isn’t there a reference to Randal Flagg in this book? More than a reference — Flagg (not Randall, just Flagg) is the book’s villain. This was my first King book, as well (other than the Creepshow comic book), read when I was 11 years old. It got me intrigued with his writing, for sure. After that I read The Talisman, and that was it, I was hooked. At 38 years old, I’m still an avid King fan. I always told my youngest daughter that this is the first King book she should read. One of his best tangents.